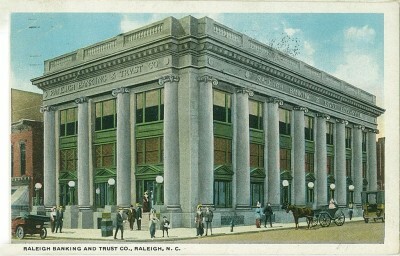 Raleigh Banking and Trust Co., Raleigh, N.C. The classic bank building seen here, a veritable ‘temple of fortune,’ still stands on Fayetteville St. — sort of. You will find out why it is still there, and yet, why it is not, this week, on Flashback Friday. This is where I am spending my Thanksgiving holidays. Am having a great time seeing the place. Will tell you all about it later. Hope you all had the best Thanksgiving ever. A typical ‘having a great time’-‘will tell you all about it later’-‘hope you had the best ever’ postcard message. All we’re missing is a ‘wish you were here’! 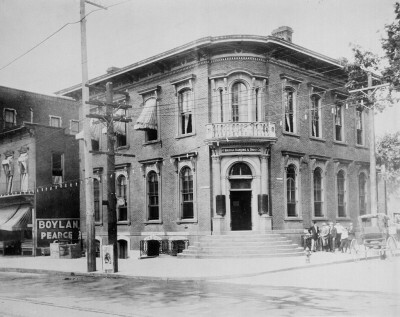 The Raleigh National Bank of North Carolina was chartered in September 1865, just four months after the end of the Civil War. To accommodate the new banking venture, the trustees completed an unfinished bank building dating from 1860, located at the southwest corner of Fayetteville and Hargett Streets. Known colloquially as “The Round Steps Bank,” owing to its distinctive corner entrance, Raleigh National Bank prospered during the ensuing years. By the end of the century it had been renamed Raleigh Banking and Trust Co. 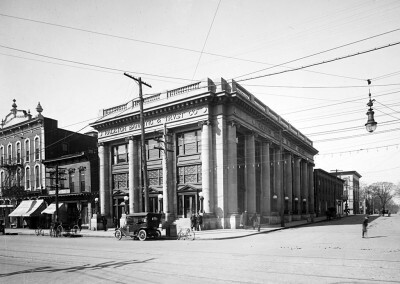 The “Round Steps Bank” occupied this architecturally distinctive antebellum building at the southwest corner of Fayetteville and Hargett Streets for nearly 50 years. In 1913 the Raleigh Banking and Trust directors engaged the renowned Atlanta architect Philip Thornton Mayre to design a grand edifice more suitable for 20th century banking purposes. Mayre’s architecural rendering of the Raleigh Banking and Trust building looks very much like the image on this week’s postcard. 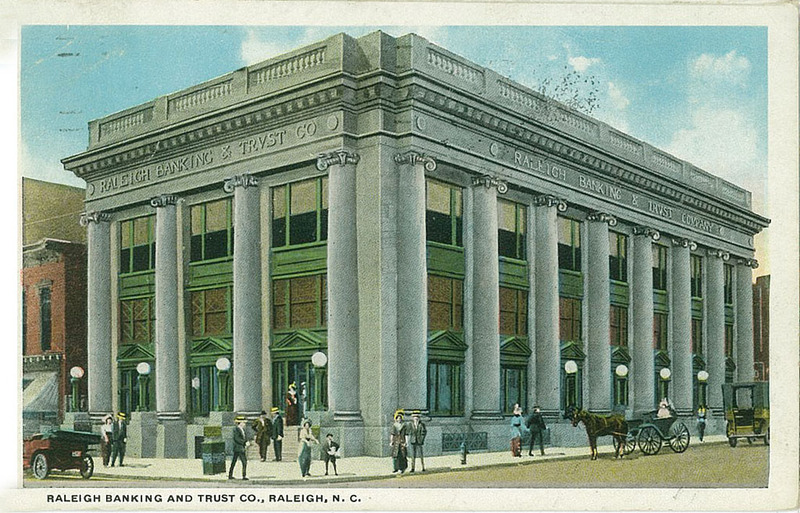 This photo of the Raleigh Banking and Trust building was taken about 1915. 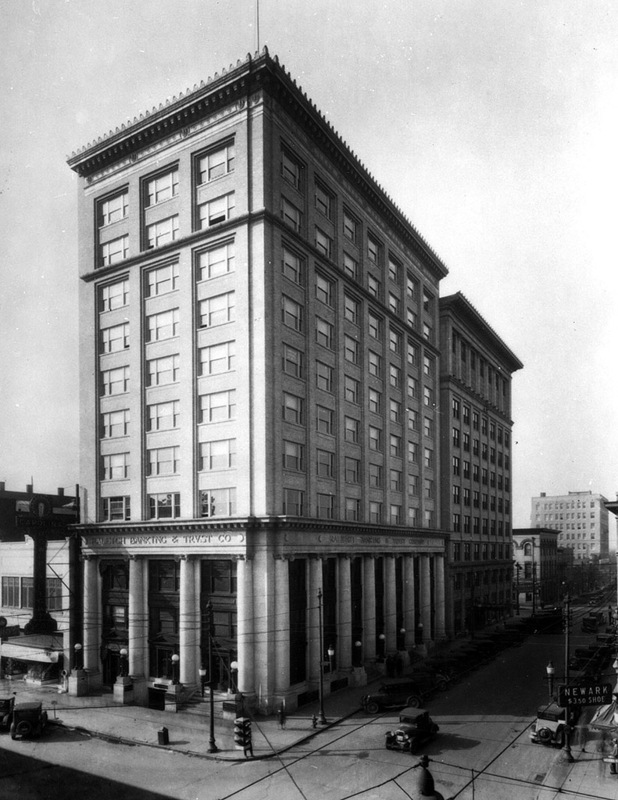 In 1928, the H. A. Underwood firm designed an eight story office tower which surmounted the 1913 building. It was designed in the Commercial Classical style, featuring a steel-frame skeleton, brick-veneer walls and ‘Chicago style’ windows. This striking photo shows the Raleigh Banking and Trust building and its new office tower together with its neighbor, the Odd Fellows Building, which had been erected in 1924. In the wake of the stock market crash of 1929, the Raleigh Banking and Trust Co. failed in September 1930 — 65 years after its founding. The building went into receivership, remaining in limbo until 1934 when the Massachusetts Life Insurance Co. purchased it. A year later, in order to rejuvenate the structure’s brand as an office building, MLI initiated a drastic renovation. 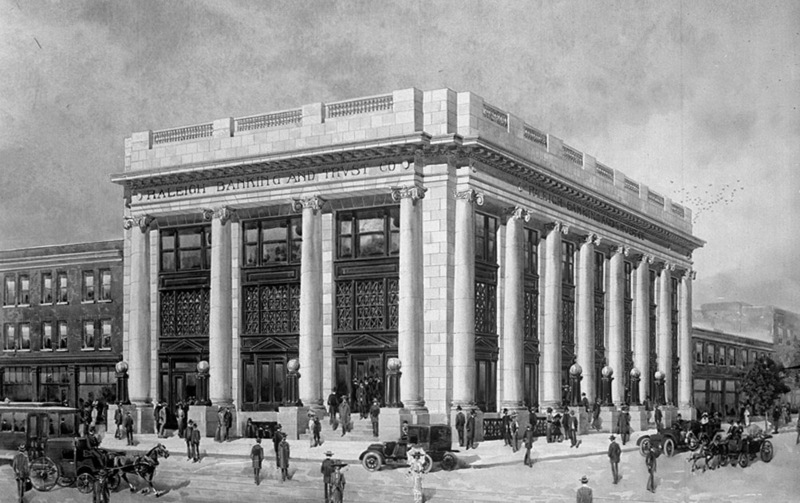 For better or worse, the monumental columns framing the former banking floor were removed, the interior space was redesigned to accommodate more office space, and retail occupancy was introduced on the first floor. The architectural motif adopted for the redesign reflected the then fashionable Art Moderne style. 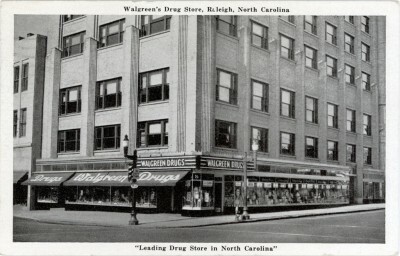 It was about this time the former Raleigh Banking and Trust Building became known as the Raleigh Building. As seen in this photo, dating to the late 1930s, the bank and the columns are no more — replaced by additional office space and a Walgreen’s Drug Store. 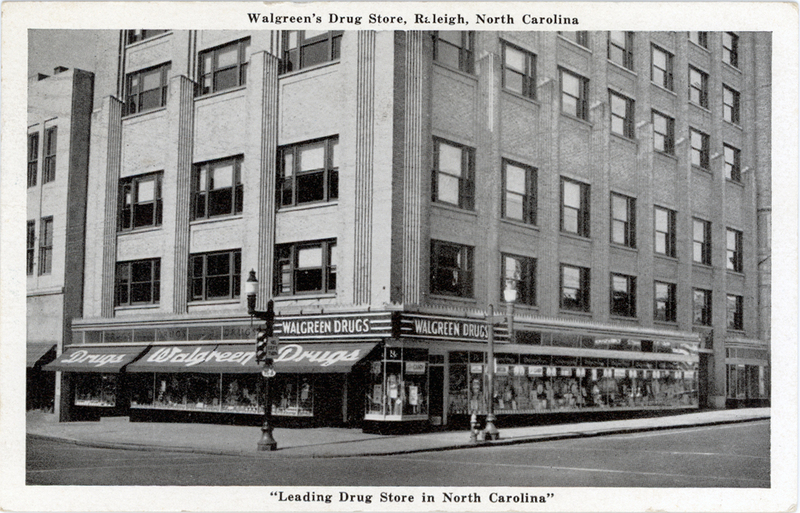 The postcard view below depicts Walgreen Drugs on the street level floor of the Raleigh Building. Interestingly, if you compare this view with this week’s postcard view of the Raleigh Banking and Trust building, you can see the ‘ghost’ of the old bank, now hidden by the brick facade and the Art Moderne pilasters which replaced the columns. The Walgreen’s space is now occupied by CVS. Today, the Raleigh Banking and Trust Building still stands on Fayetteville St,, sort of, now encompassed within the shell of an Art Moderne redesign. You can read more about the fascinating history of the Raleigh Building in The Raleigh Building: The Short Story of a Tall Building, by Goodnight Raleigh contributor Russ Wollman. Russ’ family owned this Raleigh landmark for 45 years, and he relates many personal details of growing up in its shadow. He even offers a pictorial glimpse at the only remaining vestige of the old Raleigh Banking and Trust. 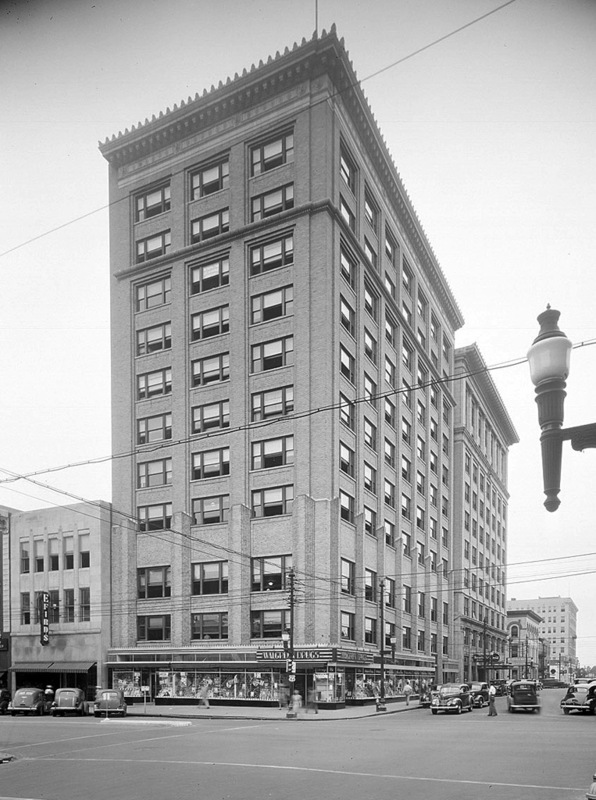 The Raleigh Banking and Trust Building (aka the Raleigh Building) has been designated a Raleigh Historic Landmark, and it part of the Fayetteville Street Historic Dictrict. It is also listed on the National Register of Historic Places. A major publisher and printer. Their U.S. factories turned out more cards in quantity than any other printer. 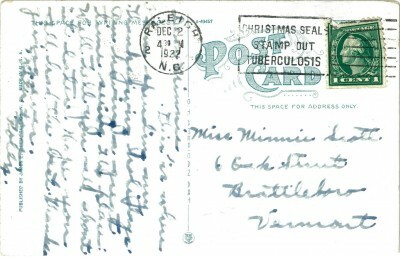 They published a wide range of national view-cards of America and Canada. By the 1920s they were producing so many postcards with borders that they became recognized as a type dubbed White Border Cards. Many consider them one of the finest producers of White Border Cards. The Linen Type postcard came about through their innovations as they pioneered the use of offset lithography. They were purchased by Regensteiner Publishers in 1974 which continued to print cards at the Chicago plant until 1978. The picture you show of the Raleigh bank in 1915, I w ould ask you to look at the second buyilding on the left. It appears to look like the Briggs Hardware Building. From the picture it looks like the Briggs Building is three stories high, whe4n it is really four stories high. Am I just seeing things? Mr Knowles: The building that appears to be Briggs Hardware is actually the Holleman Building. (Briggs is two doors down from there.) The Holleman Building was built in the mid-1870s after the fashion of Briggs. This is where Raleigh architect A.G. Bauer has his office, and where he committed suicide in 1898. The building stood on Fayetteville St until well into the 20th century. Kimbrell’s Furniture occupies the site today. Love this building and its quirky history of transformation. I enjoyed sharing its story on Jane’s Walk! It makes me think a little bit more about how like the city itself, buildings must adapt to growth and change in order to keep up. Thanks for posting!